Last night Thom Yorke was a guest on Gilles Peterson's Radio 1 show, which you can listen to right here. Thom revealed that Radiohead will be touring in 2012 saying that "The idea is to go out and play next year on and off during the year." He also went on to say that Atoms For Peace album was on the verge of being completed. Atoms For Peace includes Red Hot Chili Peppers bass player Flea, Nigel Godrich, Mauro Refosco and Joey Waronker. The band have already played a couple of shows back in 2010 and now are set to release a proper album. Thom stated that touring with Atoms For Peace "sparked something off, it was really exciting... It had really good energy." After all the King of Limbs Part 2 theories died down a little it really felt like this was the direction that Radiohead were headed. They were going to take a step back and do more solo and side projects and keep all things Radiohead on the back burner. I know we have all the Remixes of TKOL's but for a long time there a lot of us (myself included) were really pushing for some more Radiohead tunes. 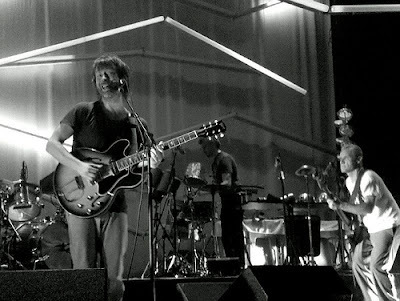 It is very refreshing to know that Radiohead will be back touring in 2012 and that we will also get a listen to what Atoms For Peace have to bring to the table.